I have two confessions to make. The first is…I am a Caesar salad addict. It’s truly one of my favorite foods – both for its ease and its taste. When I think of the perfect meal, very little brings a smile to my face like the thought of a Sunday brunch Caesar salad/Bloody Mary combination. My other confession is…I am normally a big cheater when it comes to Caesar salads at home. They’re just so easy to throw together if you cut corners on the ingredients. Pre-cut Romaine? Sure. Pre-grated Parmesan? I don’t feel guilty about that. Bottled Caesar dressing? Quit looking at me with that disdain in your eyes. We all have our food secret shames – that is one of mine. 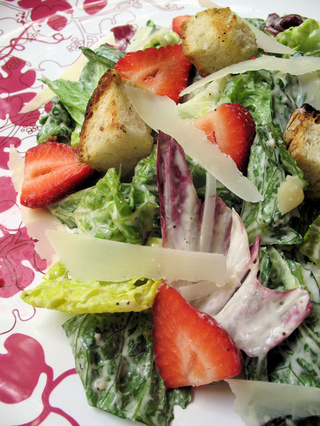 The thing is…I prefer a creamier Caesar dressing than the vinaigrette-style recipes I normally see. Plus…its so simple. Sometimes, being easy makes something that much more delicious. When I saw that the theme for HHDD #12, hosted by Katie at Other People’s Food, was Caesar salad, I was both overjoyed and mildly ridden with anxiety. I felt a lot of pressure to make some fancy-pants twist on the classic. However, I’m sticking to my guns. I *like* the classic. For me, going out on a limb for Donna Day was making my own dressing. I hunted down a creamy Caesar recipe online…and true to its word…it was every bit as scrumptious as the author of it says it is. True to my normal salad form, I added a sweet twist to my recipe: slices of the first truly ripe and wonderful strawberries I’ve had so far this year. Added to radicchio, romaine, homemade Ciabatta croutons, and fresh Parmesan shavings…they really added a new element to the salad….and no cheating. – In a small 2-cup mini food processor, process/mince the anchovy fillets and garlic together until finely minced (do this together and firstly, otherwise it will not get minced properly with the other ingredients). – Add in the remaining ingredients, and process for 30 seconds, or more until well mixed. – Adjust seasonings to taste. – Thin with buttermilk (or milk) for a thinner consistency if desired. – Store in fridge, covered in a glass container for 3 or more hours before using (the flavors become stronger when left in the fridge for a longer time). Okay, I’m an addict like you and it it all the time. I applaude you for revealing your shame but I hate to sound horrible but you should be ashamed. Precut Romaine I can live with. Pre-grated Parmesan? Okay, I know it can go hard in the fridge but how hard is it to keep a small chunk and grate it? But then it gets worse the mayo and cream/milk. I’m sorry but I’m a complete fascist on this. With oil and an egg yolk being whisked in to the purist recipe it is quite creamy anyway. 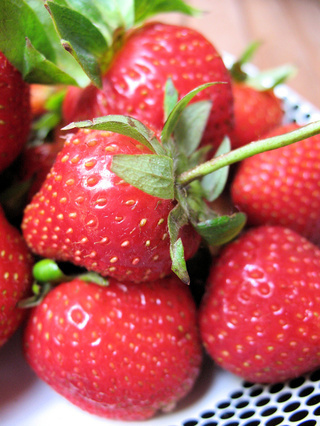 Then strawberries! I have, with plenty of psychiatric help, just about come to terms with Caesar salad with crisp bacon (ouch,! That hurts just to say it) and once even enjoyed one with a perfect moist breast of chicken. I say this with shame as I think that the pure Caesar is the best. I also say it with shame because I meant to join this meme but didn’t. I shall keep reading you with hope that perhaps you will see the light and lose all of these fripperies. Fantastic pictures though. Sorry for acting like Typepad. You big bully Ed. I say live with the shame Tami. Looks wonderful and I like the addition of strawberry. Thanks for joining in. Thanks for backing me up on this one :) Your blog is just beautiful…thank you for stopping by! Just kidding. I will own my flaws. THanks for commenting, though. Yeah…and you missed mine!!! I love the look of your caesar! Wow…I bow to your cool calm nerves…I think I would not been as nice to Ed…I am still growing up I guess! Ooooh, a kindred spirit! I am also a total Caesar addict – it is probably the single dish I have ordered more than any other in restaurants and, like you, when I picture my ideal meal, a Caesar is definitely part of it. My favourite light supper is a Caesar salad with a piece of grilled salmon plonked on top… Mmmm!